Adhesives require a chemical reaction to convert their structure from the liquid to the solid state. Once cured, the adhesive provides a high-strength bond between two substrates, which resists temperature or humidity changes and is impervious to many chemicals. There are several ways to achieve the reactive curing process, such as light, heat, moisture or the combining of two reactive components. A UV-curing adhesive contains photo-initiators that start the chemical reaction when exposed to light of the appropriate wavelength and intensity, usually wavelengths of 250 nm to 400 nm. The UV-curing mechanism can be applied to several types of chemistries; there are UV-curing acrylics, epoxies, silicones and cyanoacrylates to name a few. Like any curing process, UV curing has its advantages and disadvantages. The UV-curing process is flexible. Since it depends on the intensity of the UV light, the curing time can be controlled and can be as fast as a few seconds at high intensity or much longer at lower intensities. UV-curing adhesives are typically single-component formulations requiring no mixing, and generally low-viscosity formulations with minimal solvent content. The uncured adhesive has a relatively long shelf life, sometimes up to 24 months, and is easy to handle as long as appropriate precautions are taken to minimize ambient light. Some UV-curing adhesive formulations contain fluorescing agents that will only shine when the product is fully cured. These allow manufacturers to perform in-line visual inspections of their processes, ensuring that bondlines are completely sealed between two substrates. After curing, UV-curing adhesives are non-toxic and suitable for a wide range of applications, such as medical-grade adhesives to assemble needles and catheters, conformal coatings to protect sensitive electronic components or deep curing formulations used for encapsulation and potting of components. UV-curing adhesives can be formulated with a secondary moisture-curing mechanism for use in shadowed areas that aren’t reachable by the UV lamp. The moisture comes from the air and best performance is achieved by combining both methods to fully crosslink the adhesive matrix. Dual-curing adhesives fixture rapidly after UV exposure and continue to build strength and environmental resistance as the adhesive cures over the course of several days. On the other hand, there are a few disadvantages and limitations. Curing requires a light source that emits UV light at a wavelength that matches absorbance of the photo-initiator of the adhesive. All adhesives do not operate at the same wavelength. 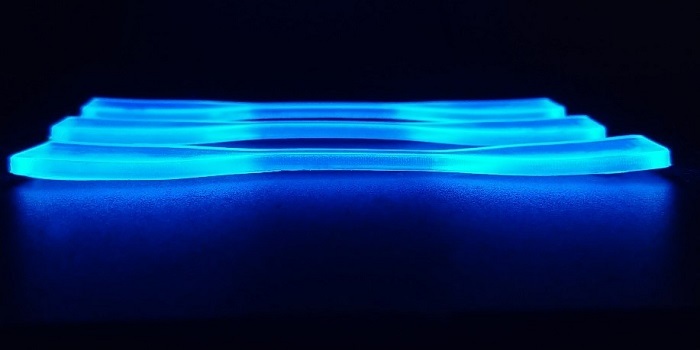 The source can be a mercury vapor lamp, a UV fluorescent lamp or a UV LED, but it represents an additional cost compared to other adhesive technologies. The light output slowly degrades as the lamp ages, increasing the curing time and eventually requiring replacement of capital equipment. Unless the adhesive includes a secondary curing mechanism, the UV light from the lamp must illuminate the entire bond area; shadowed areas will not cure. It is important to note that not all substrates are usable with UV-curing adhesives. It will only be possible to cure the adhesive through materials that transmit light at the specific wavelength of the lamp. UV and visible light can only reach a certain depth, with the limit generally around 10 mm. It should also be noted that exposure to UV light can be harmful to human operators, who need appropriate eye and skin protection. Chemence® has developed UV-curing formulations that combat a majority of these issues. Broad-spectrum cured adhesives contain photo-initiators that respond to a range of wavelengths with a bell-shaped response curve over the 250 nm to 400 nm range. A medium-pressure mercury arc or metal halide bulb lamp provides optimum curing. LED optimized formulations have also been developed to work specifically with curing systems utilizing LED light sources in the 365 nm to 405 nm range. A variety of formulations is available to provide tack-free curing – eliminating the potential for oxygen inhibition, which causes a permanent surface tackiness on adhesive exposed to the atmosphere. Chemence® has also developed several dual-cure formulations that rely on light for initial cure and then achieve full cross-linking after exposure to heat or moisture. Chemence® has optimized an extensive range of UV-curing adhesives for bonding, tacking, sealing, coating, encapsulating, laminating and potting. 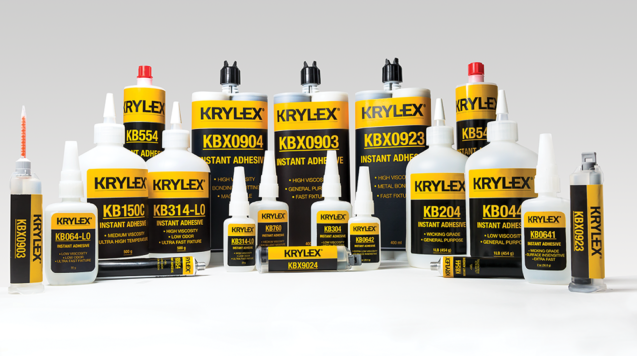 The KRYLEX® UV-curing product line includes both acrylic and cyanoacrylate adhesives, with formulations for high-strength, tack-free, dual-cure and fast-bonding applications. Chemence® Medical has ISO 13485 certification and currently manufactures Class 2 and 3 medical devices. It will soon introduce a line of UV-curing adhesives for medical devices, including needle, catheter and tube set assemblies under its KRYLEX® brand.